Do you remember those bizarre home remedies your grandmother used on you when you were a kid? Here are the ones that really work. 1. Potato for spider bite. Okay, we admit it. This one sounds super weird. But according to Don't Waste the Crumbs, it really works! Cut a large slice of raw potato and then use medical tape to bind the potato to the bite. Replace the potato slice with a fresh one every 12 hours. After one week the bite should heal. 2. Garlic for a toothache. In the 1740s, the founder of Methodism John Wesley wrote a book of cures. Mental Floss says he cited sticking a clove of garlic in the ear as a cure for a toothache. 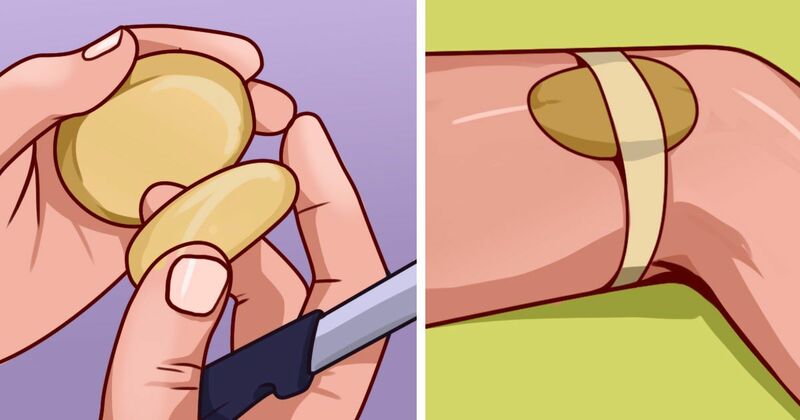 As a version of this, Umpah recommends rubbing half a garlic clove against an inflamed tooth for 7- 10 minutes to reduce pain and heal the infection. 3. Orange rind for a head cold. Many nasal sprays now come in an orange flavor. This isn't just for your taste. According to Mental Floss, rolling an orange rind and sticking it in your nostrils was a common 18th century cure for a head cold. 4. Vodka for foot odor. This one makes sense. Alcohol kills bacteria, and bacteria causes odor. Therefore, alcohol should eliminate food odor when applied to the foot. Prevention recommends wiping your feet with a cloth soaked in vodka. Rubbing alcohol works just as well as drinking vodka. 5. Pencil for headaches. Prevention says this simple remedy works because headaches are often caused by the subconscious clenching of the jaw. To treat a headache, place a pencil between your teeth and relax your jaw muscles. You'll be surprised just how quickly your headache disappears. 6. Yogurt for bad breath. Stink breath in the morning? Eat yogurt says Prevention. The healthy bacteria in the yogurt can counter the bad odor-causing bacteria. 7. Licorice for calluses. Licorice can soften calluses, says Prevention. Unfortunately Red Vines won't quite work. Instead, mix ground licorice with 1/2 teaspoon petroleum jelly and rub the solution into calluses and corns. 8. Olive oil for motion sickness. Prevention says eating olives when on a winding car drive or undulating boat can prevent motion sickness. This is because motion sickness typically produces excess saliva and olives contain tannins that help dry out the mouth and quell queasiness. Tell us your favorite old school remedies when you SHARE this article on social media!